This is a project that Joe and I did about two years ago. We did this in about 2 days and for super cheap. The most expensive purchase was the mirror and paint. Everything was under $200. The photos (of course, coming from me) are not the best. Mostly because the bathroom is small and hard to get photographs of! This little bath is right inside the entry from our garage, so I've always called it the entry bathroom. It's the one that you make a mad dash for when you've been on a trip, drank too much water, coke, juice, etc. and are just pulling in the garage and yelling at the husband to give you the keys and...oh, wait. Maybe that's just me. After looking at these, I'm leaning heavily towards putting up beadboard or doing some sort of wainscoting on the lower half of the walls...hmmm...I think I found my next after nursery project!! 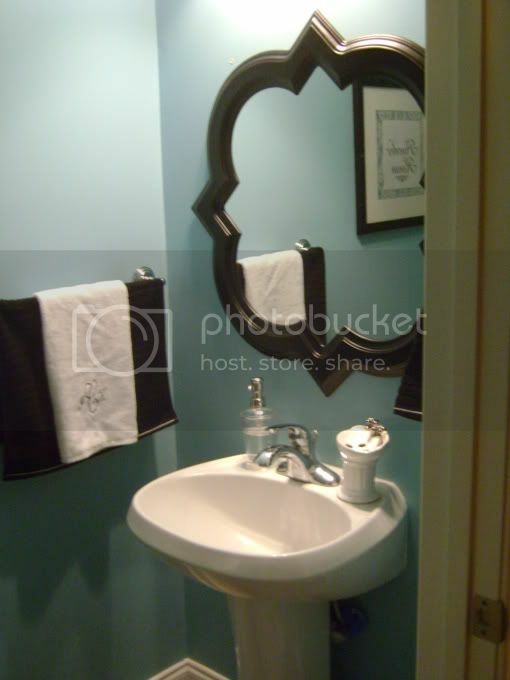 A little Tiffany Blue paint (actually called Alpine Glacier) a new mirror, and some black, silver and white accessories....and you have a different room. Ignore the feet...so difficult to get a good image of this little space that I had to stand on the toilet to get this shot! This photo is the best representation of the color. Shameful to post a pic with such wrinkled linens. Don't know what I was thinking that day! The "artwork" was super cheap. My Mom used to be an area manager of a large restaraunt chain that updated their decor a few years ago. They were tossing all of these frames (the frames had photos of things like blocks of cheese in them, lol) and we saved them. 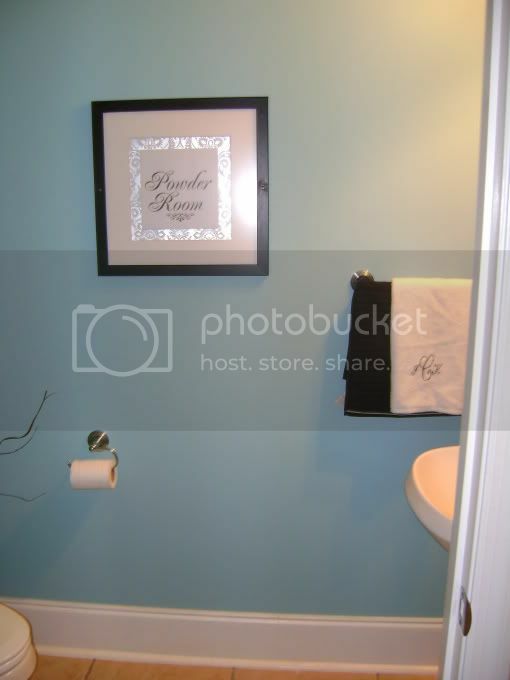 I used silver and white damask wrapping paper and then printed "Powder Room" on white paper on the computer. The tile looks a little orange-y in these pics, but it's not. It's more of an off white color. I'll try to get a better pic. It extends throughout my kitchen, breakfast nook, laundry room and garage entrance and was already here when we bought the house. I'm linking up to Transformation Thursdays, come by and see all of the fabulous entries there! 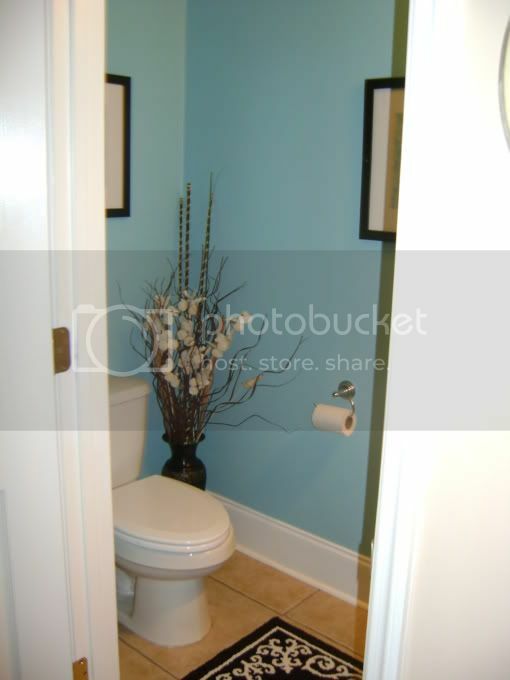 Taking pictures of a small space is so hard and you did a great job! The blue you choose for the walls really makes the space. Love the contrast of the dark wood mirror. Love it! The color is bright and cheery - and the black makes it sophisticated! Our entry bath is gutted! We need to finish other rooms first! Your powder looks looks terrific! Did you say where you found the mirror? Love it! I totally understand what it is like taking pictures of small bathrooms. Both of ours are teeny. 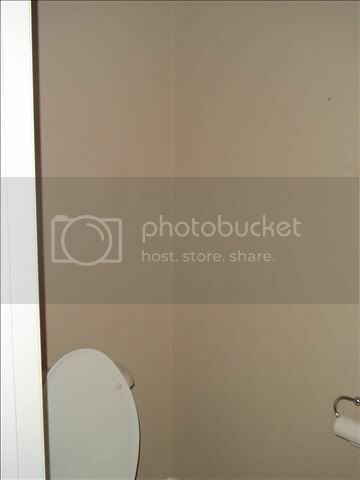 I love your bathroom makeover. The lue is just glorious! I have that same black and white rug in my home! You did such an excellent job! The blue color is so pretty. 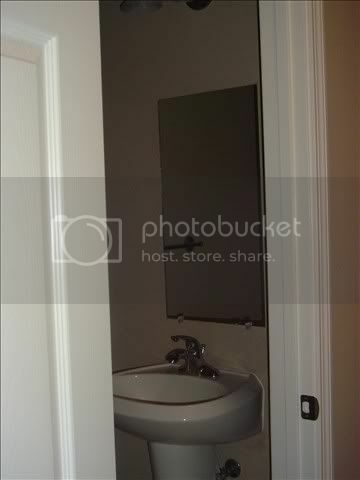 what size is the frame of the "powder room" picture? 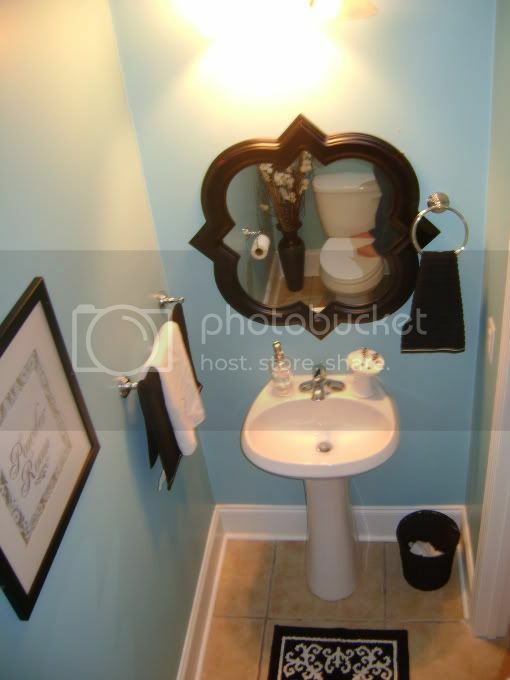 i would love to do that for my bathroom...our powder room are so similar in every way..color and all! !